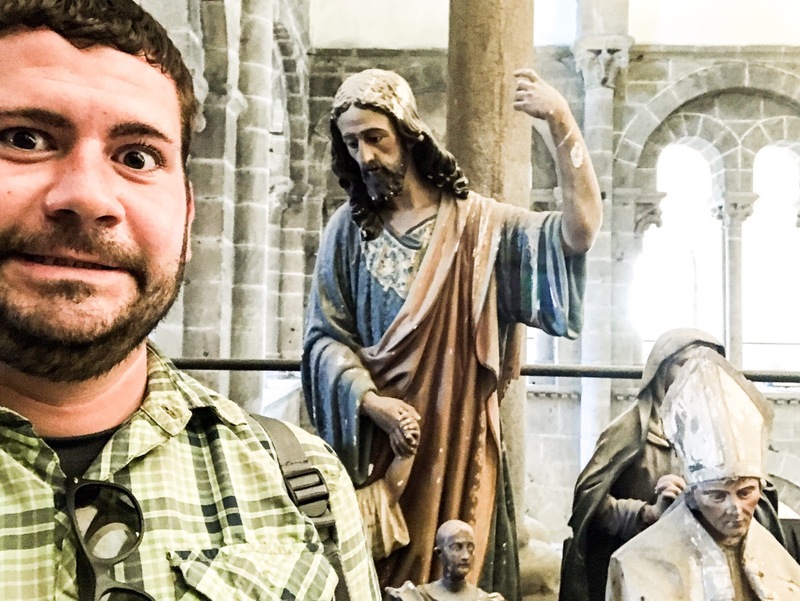 Since it took a little over a month to get here, Mikey decided to devote a full day to the Cathedral of Saint James. The most famous facade is known as the Puerta de Gloria. 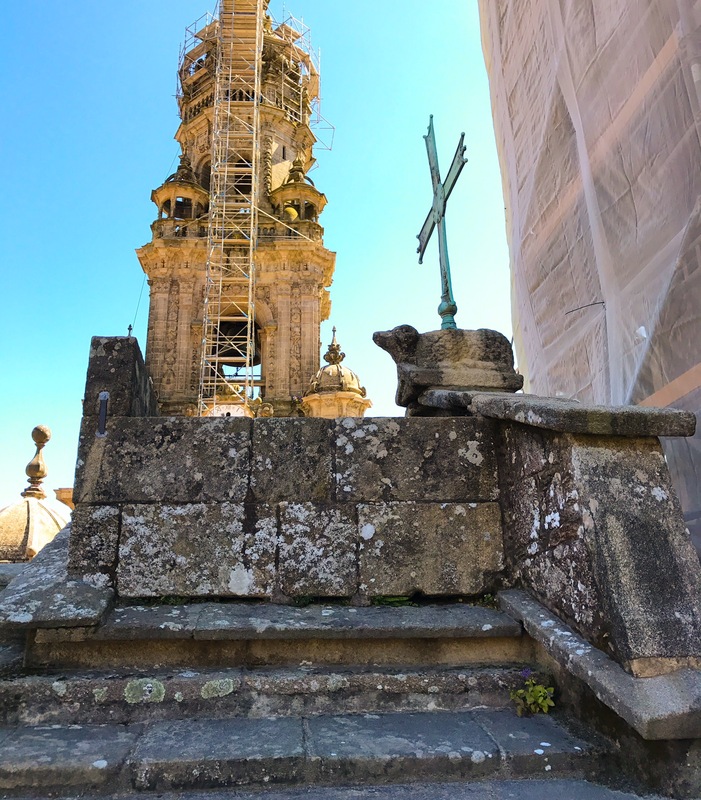 Although the Baroque exterior which is being renovated was a later cosmetic addition, the church was built in the 11th and 12th centuries and consecrated in 1211 CE. Ergo, it was constructed in the Romanesque architectural style. 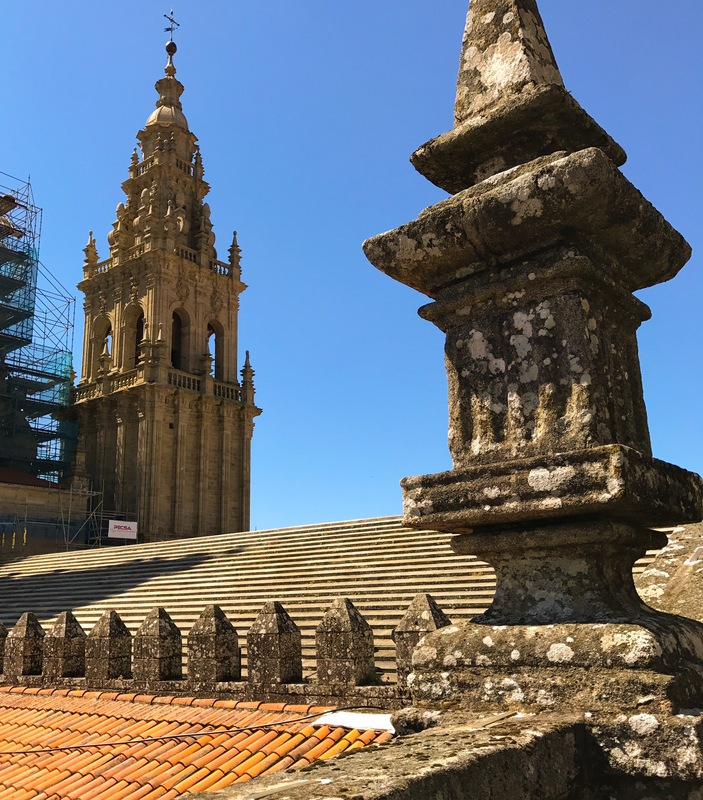 The main plaza takes on a circus-like atmosphere with newly arrived pilgrims congregating, relaxing, and giving thanks for the journey’s completion and congratulations to each other. 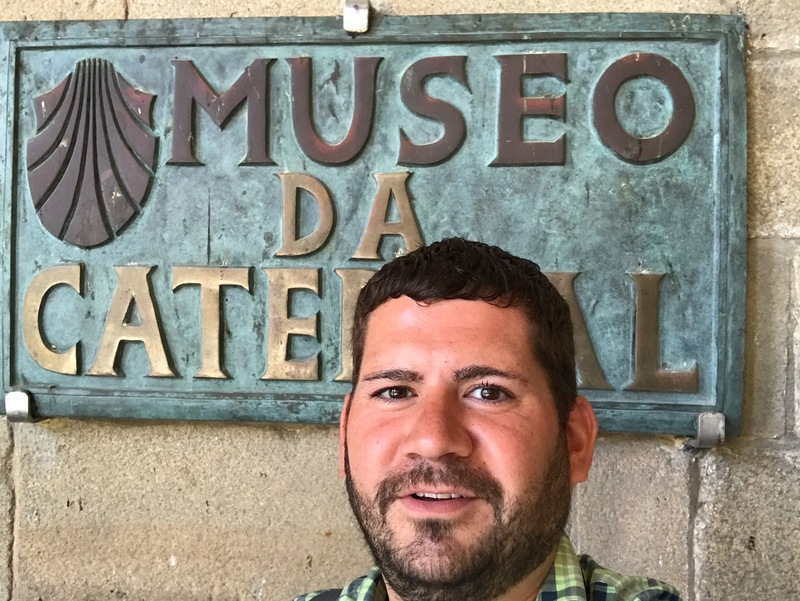 ​Mikey shot this quick video earlier in the day from the church museum. The plaza wasn’t really busy yet! 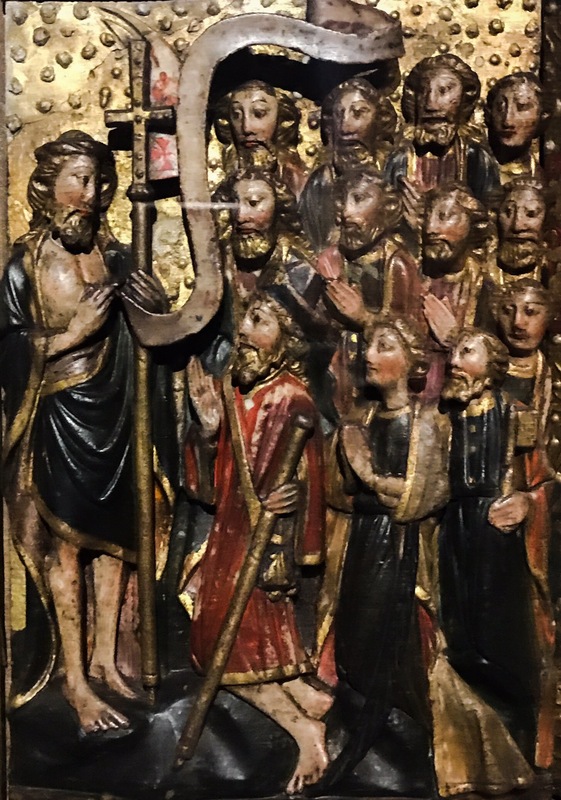 Speaking of the museum, let’s head inside with Mikey and show you an altarpiece that sums up the life of Saint James. 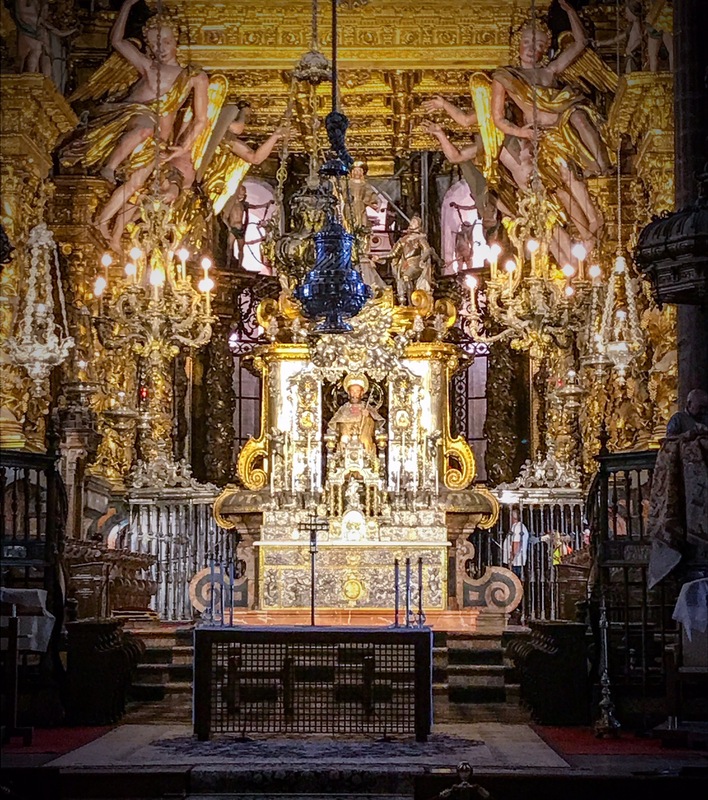 If you’ll indulge Mikey for a moment, we’ll breakdown this Baroque altar to refresh your memory on why everyone has walked to Santiago. James “The Great” and his brother, John, were both fishermen and the sons of Zebedee. 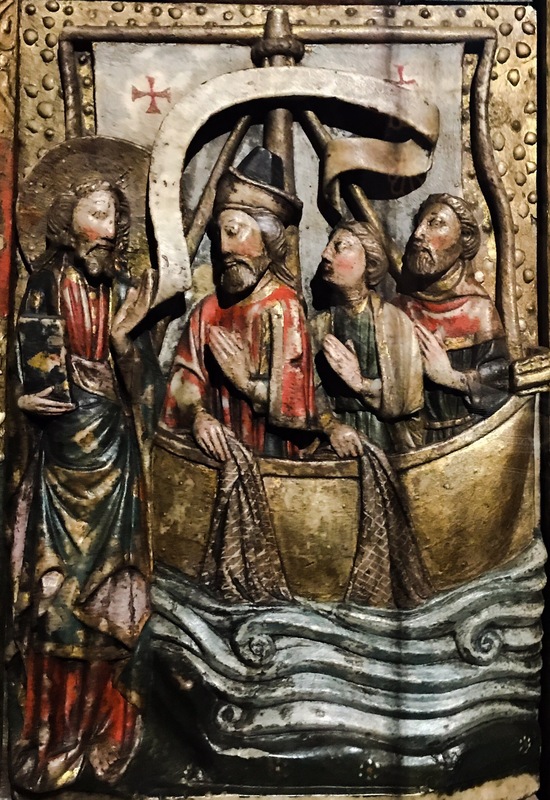 Jesus happened upon them one day and asked them to join him and become “fishers of men.” They said cool and joined his group. Following the resurrection, Jesus issued the Great Commission wherein he instructed the apostles to spread the gospel to all lands. James said OK.
James was a real go-getter and took what Jesus had said literally. 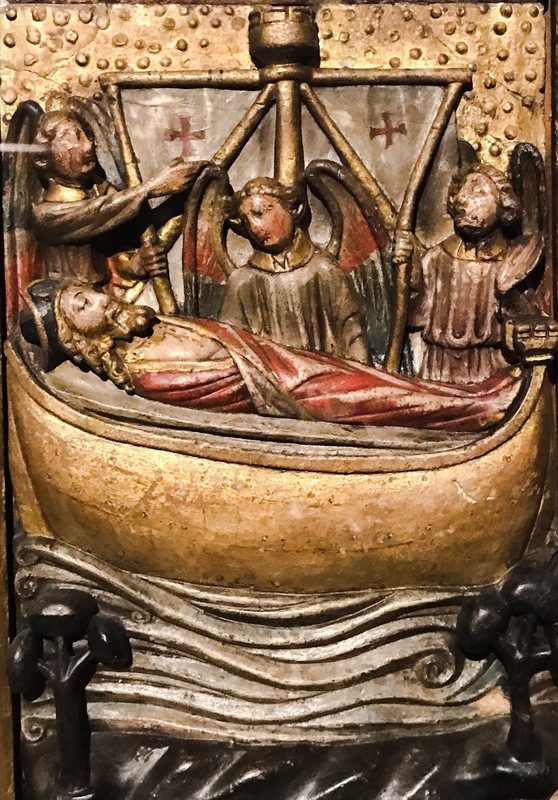 He ended up on the Northwestern coast of Iberia trying to convert the Celtic pagans there. Still, it looks like he wasn’t as successful in life as he would later be in death. Speaking of death, Kind Herod sent word that he wanted to chat with James right around 44 CE. 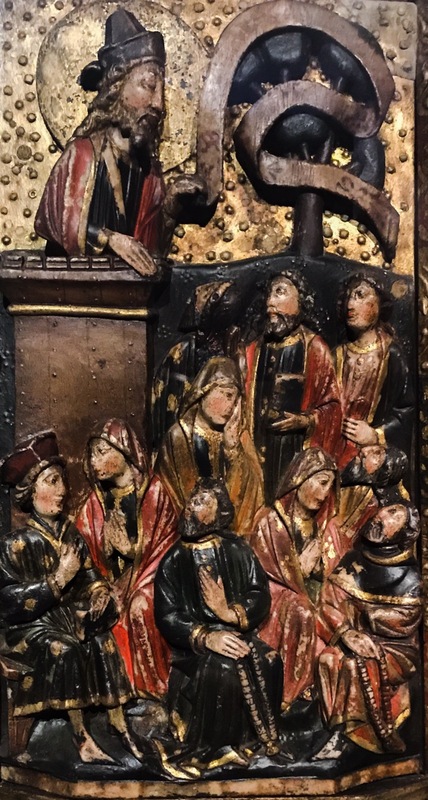 So James goes back and is like, “What do you want?” That’s when Herod cuts off his head making James the first of the apostles to be martyred. So a few centuries pass and a shepherd finds the remains of now Saint James below a field of stars (the Milky Way). The local priests step in and decide to build a church called Saint James (San-tiago) of the Field of Stars (de Compo-stela). 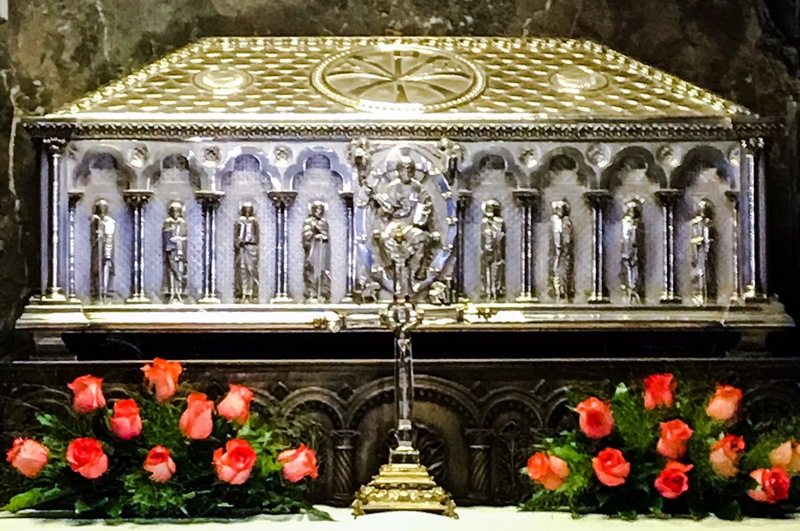 Well, they take the bones and put them is a silver ossuary (it’s like a coffin, but smaller because you just put in the bones) which is burried below the altar. 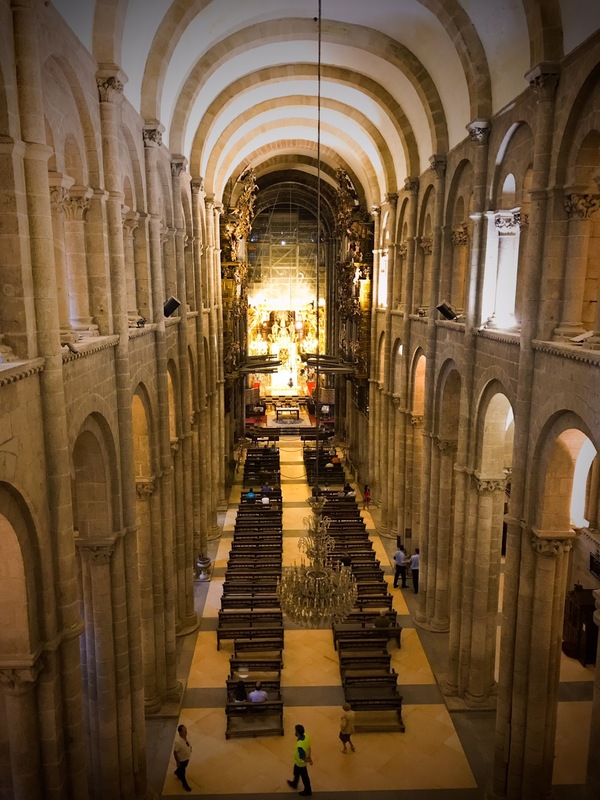 Since everybody loves a good pilgrimage, what starts as a regional hike to the church becomes a much bigger thing during the Crusades when Jerusalem is under siege. 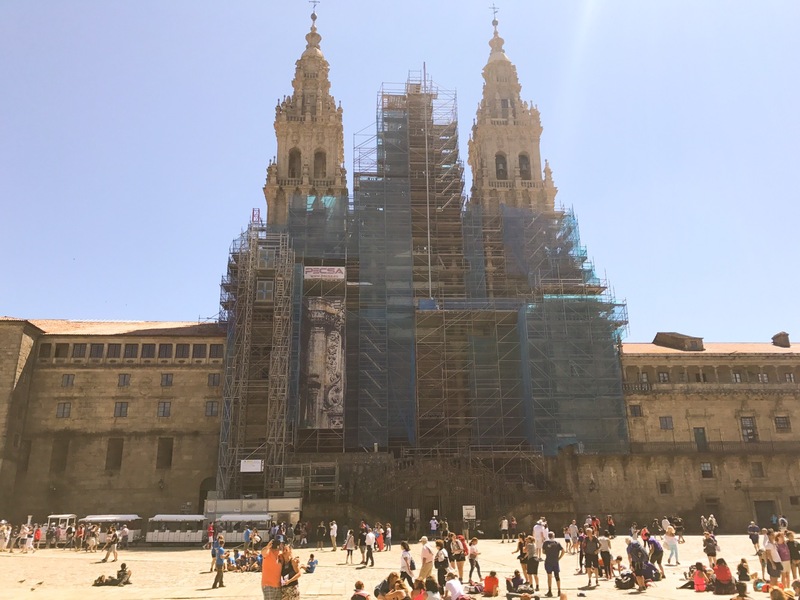 So, the bigger Cathedral is built and the Camino de Santiago or Way of Saint James is now the in thing to do for catholics. 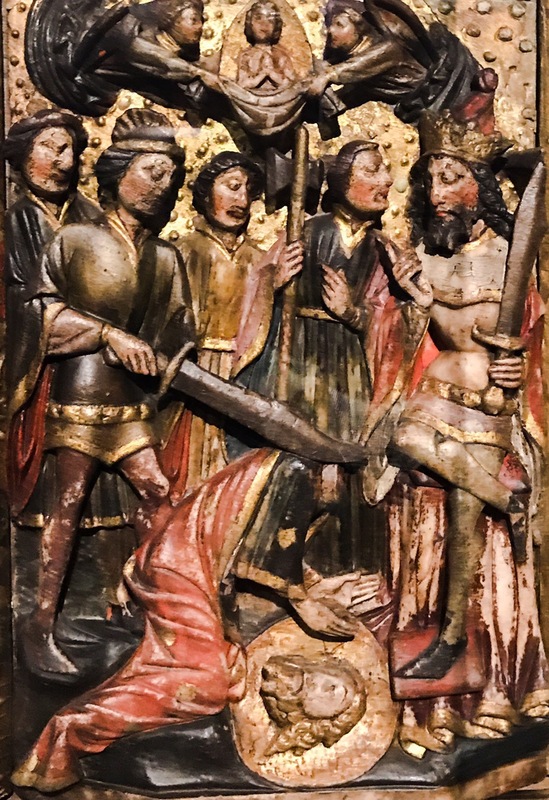 Well, the muslims just won’t quit, so Saint James helps out a few times by appearing on horseback and slaughtering the infidels. 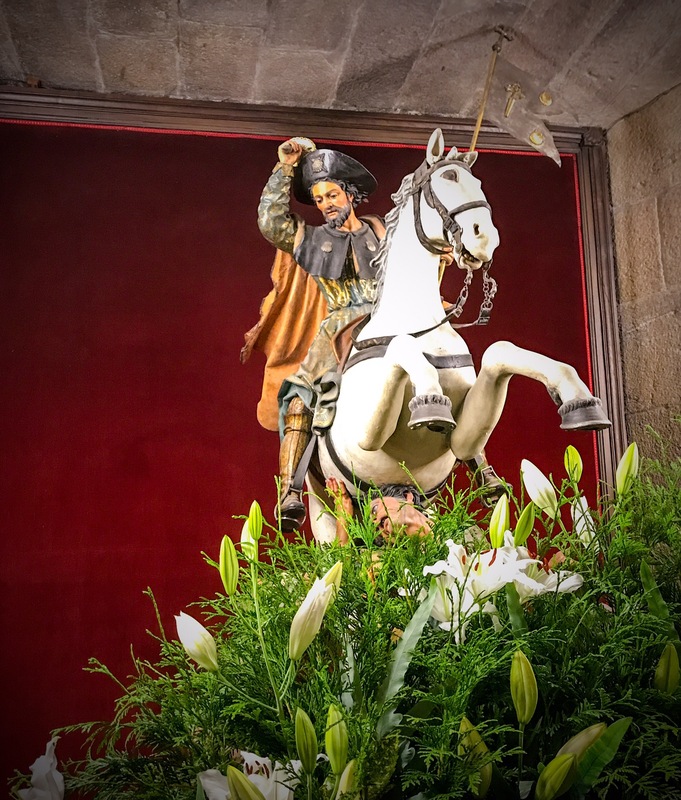 Whether or not this happened, he got the new title of Santiago Matamoros or St James Moor-Killer and became the patron saint for equestrians. OK, the history lesson is over. This is his pretty cool looking altar. You may notice the darkish silver thing hanging in the middle. 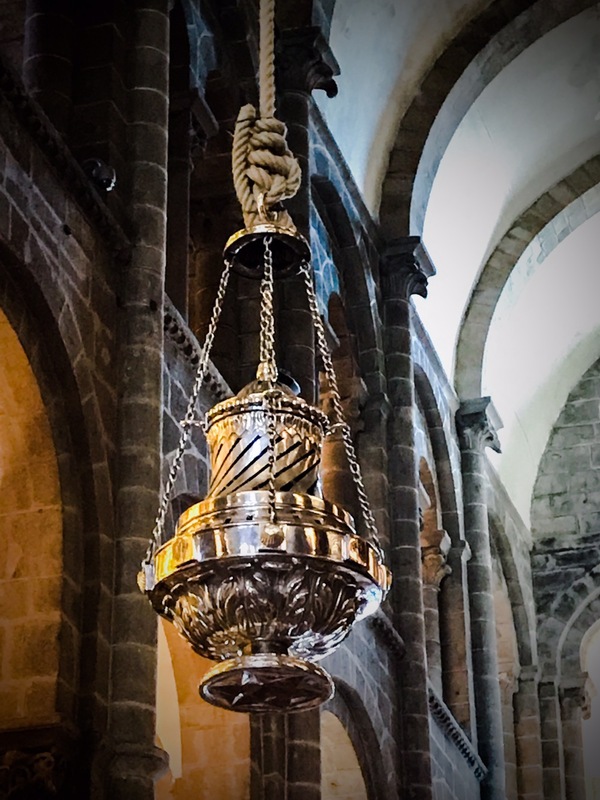 That is the butafumeiro or censer which is swung during many pilgrims’ masses. Click here to see Mikey’s video of it in action! 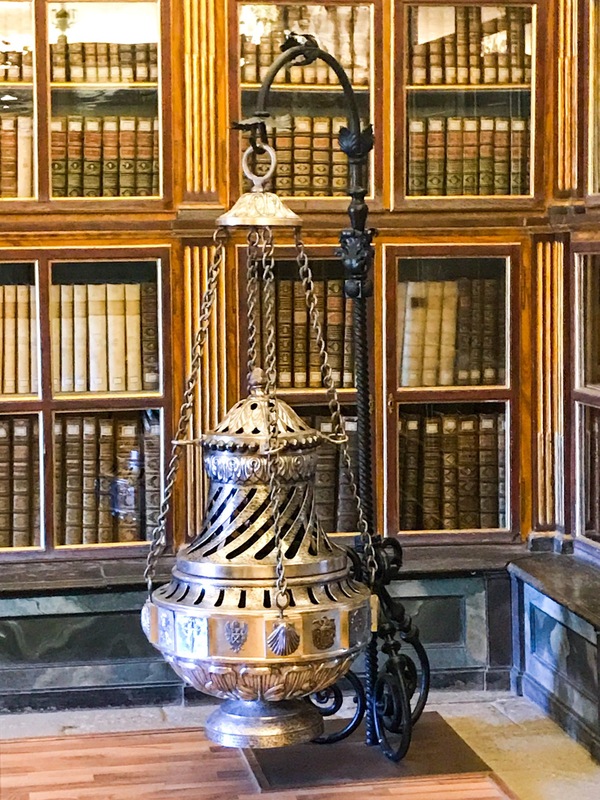 Oh, and just in case they get too zealous and it flies off – there’s a backup in the archbishop’s library. 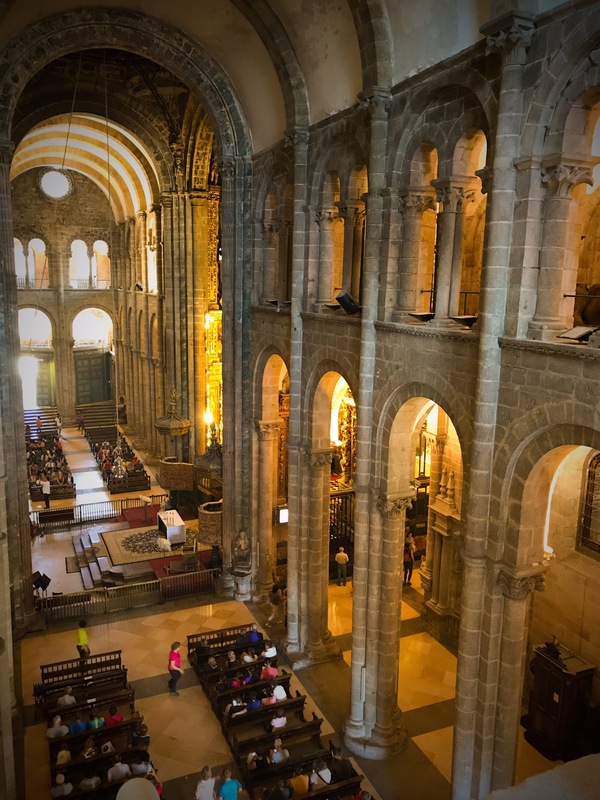 Like the butafumeiro, this is a most impressive cathedral that really has to be seen from many vantage points. So, let’s start climbing! This is a view of the nave from the tribune level which is basically the balcony that runs alond the interior perimeter of the church and was used by clergy so as not to interfere with services continually being celebrated below. 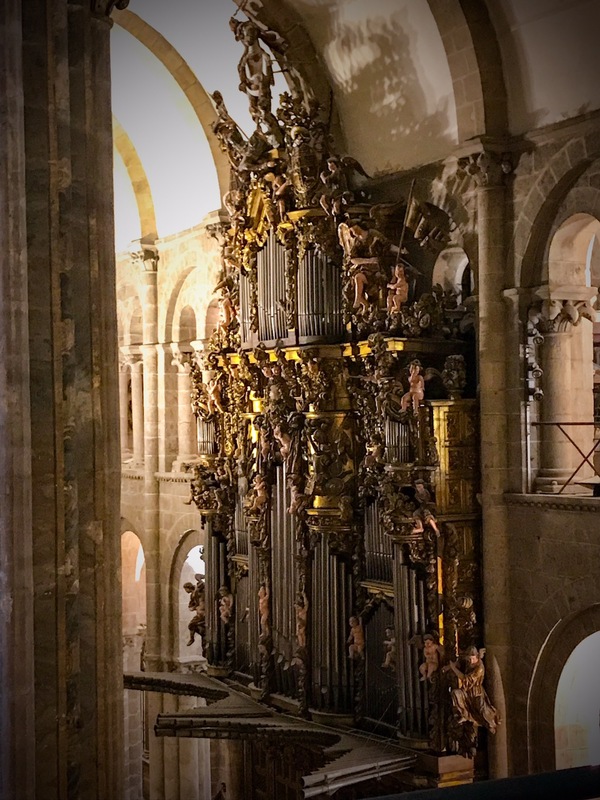 This Baroque organ is the largest in Spain. It is from the 17-18th centuries and sports the uniquely Spanish style of horizontal trumpet pipes. Oh, the really cool part is that as there are two sets of pipes placed across from each other, there had to be two organists. Yep – it was like a dueling piano bar every Sunday! Oh, and we ran into these larger than life figures along the way. 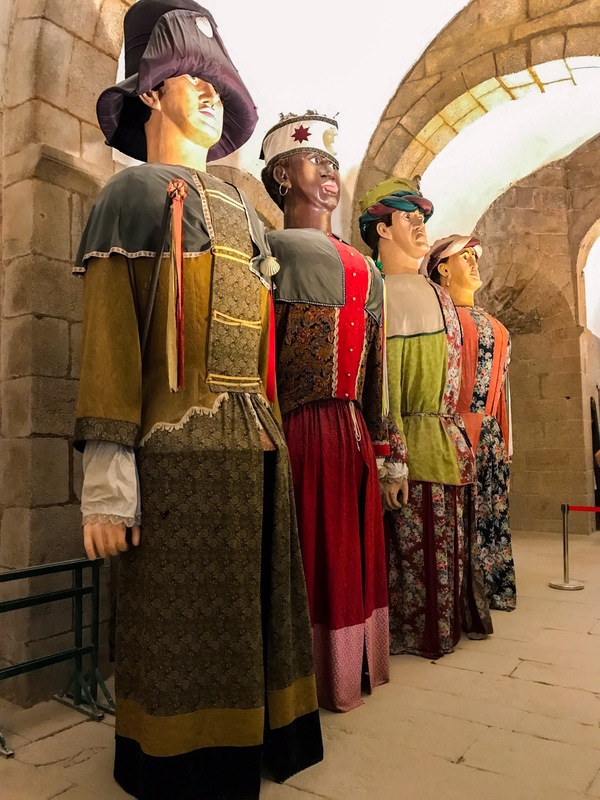 Galicia has this weird tradition of parading giant paper mache figures through the streets during festivals, so this group will be lowered on the 25th of July for Saint James’ feast day. Also trying to be larger than life, Mikey wanted a selfie with Jesus. 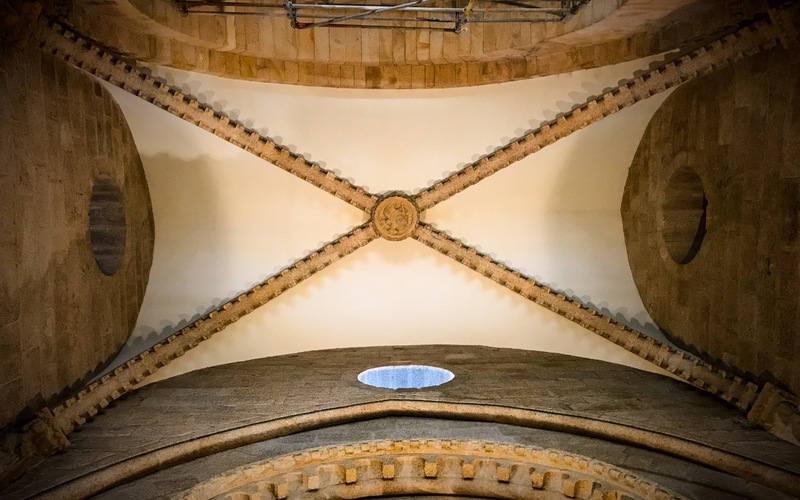 Although the church was built in the Romanesque style, it is in one of the last parts to be completed that we see a proto-Gothic style of vaulted ceiling. 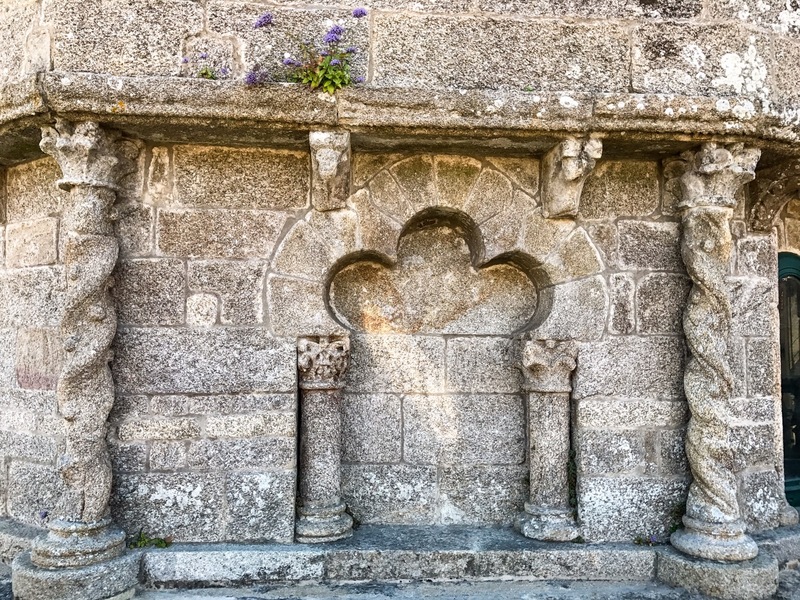 This was perhaps the first notion of a style that would come to dominate both Spanish and European architecture for the next few centuries. 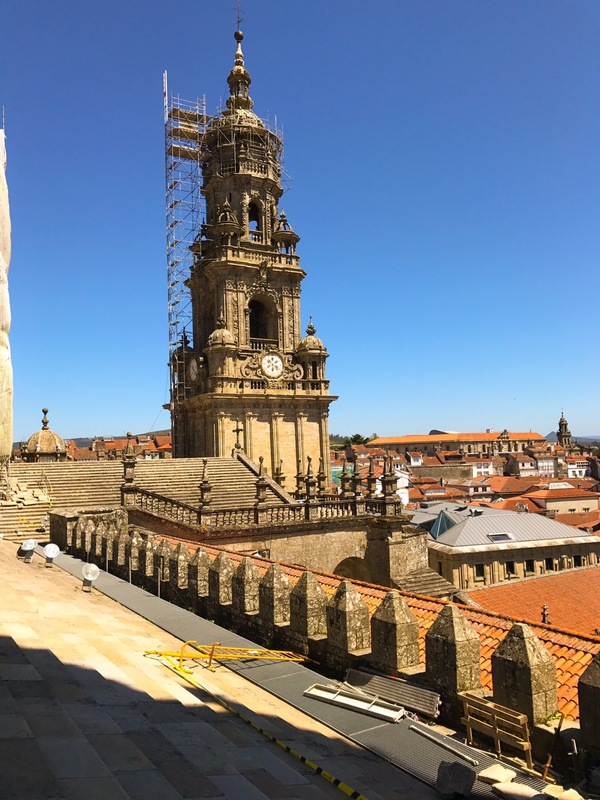 Stepping outside onto the roof, we can see the oldest medieval part of the cúpula with its twisted columns and moorish arches. Wait, did I just say on the roof? Yep – they let Mikey up on the rooftop! Actually, it was constructed with a stepped rooftop that allowed the bishop’s soldiers to defend the cathedral from attack. Yes, both Islamists and rival Christian factions attempted to seize the church from time to time. So they constructed most Romanesque churches as both houses of worship and fortresses against pillage and plunder. 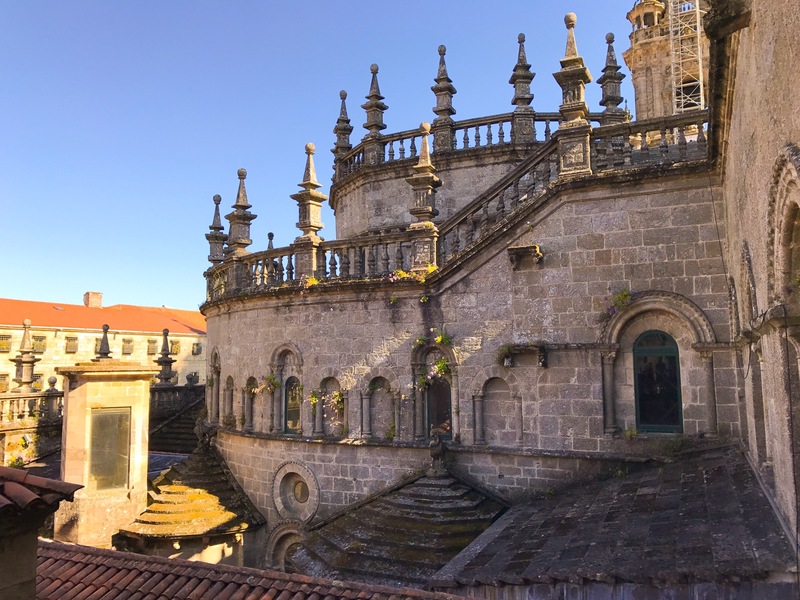 Although most of the battlements were removed by the 18th century during which Spain unified and local fiefdoms were outmoded, this one section remains along with the stepped rooftop that is 60% original from the medieval build. This is another fun rooftop accessory: the clothing incinerator. 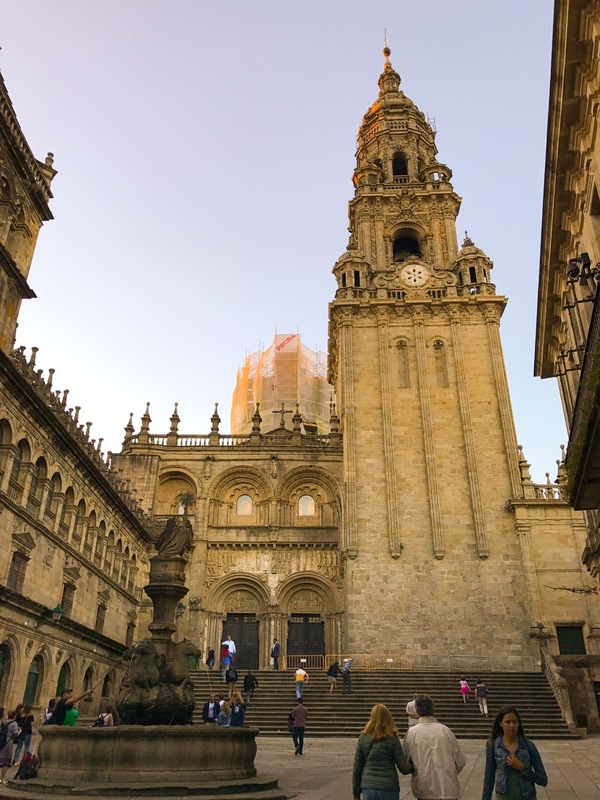 As was customary during the medieval age, upon reaching Santiago, pilgrims would burn their clothing and the Church would provide new garments for them. Think of it as a rooftop barbecue pit! This is another view of the oldest section. Note the flora sprouting out of multiple crevices. 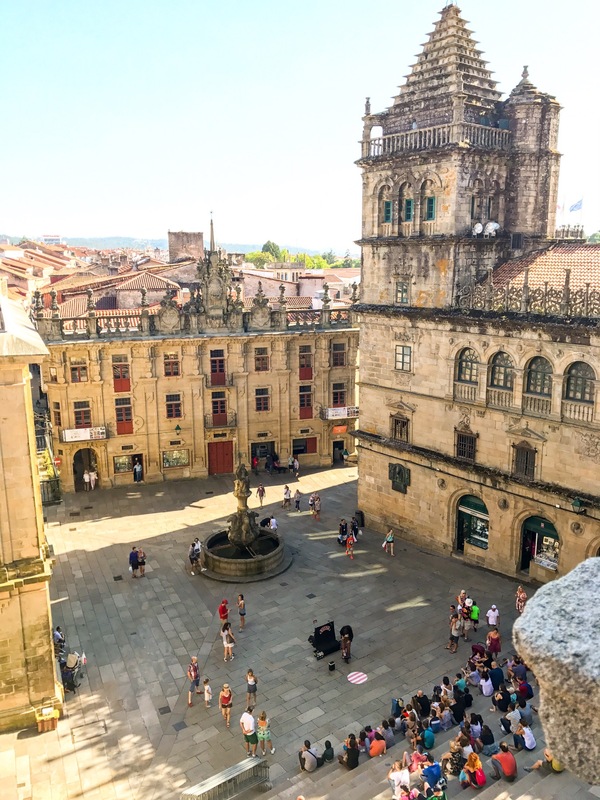 The rooftop definitely provided wonderful views of the plazas below. This is looking back to the previous vantage point from the plaza outside of the Door of Pardon. This is also the only surviving original Romanesque exterior facade. After the cathedral, Mikey headed over to the USC quad. Yeah, this is probably only funny to him because USC in Los Angeles was the University of Southern California and the rival to Mikey’s alma matter, University of California, Los Angeles (UCLA). 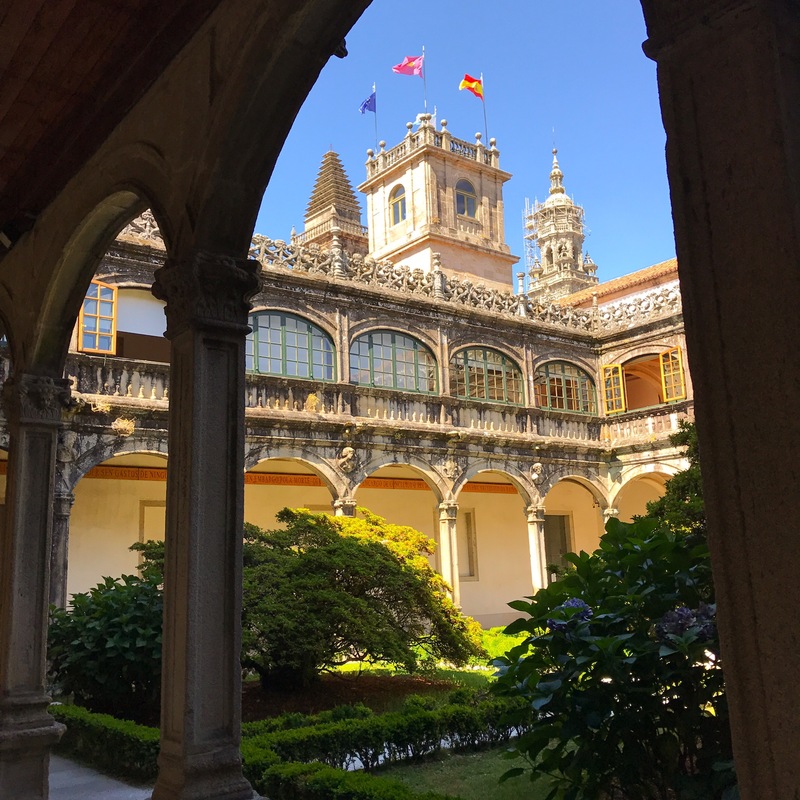 So, the University of Santiago de Compostela (USC) was a more palatable host. 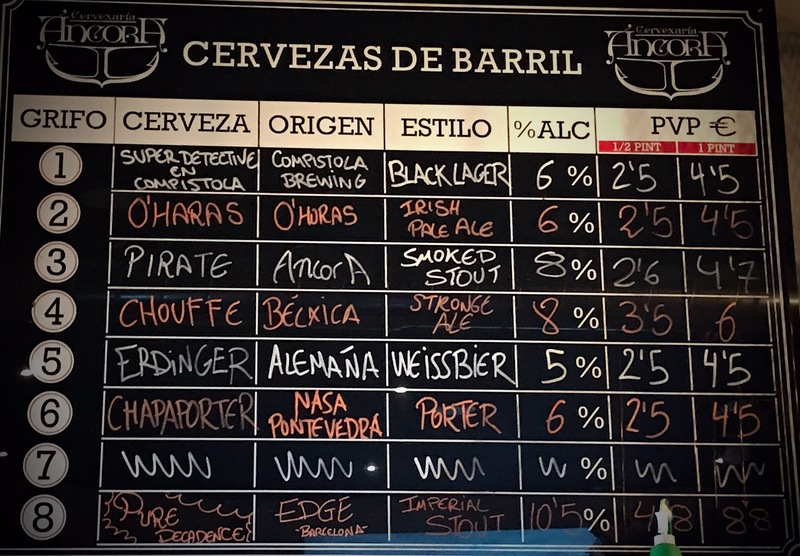 Keeping the college theme going, we wandered over to the Cervecería Áncora Beer Lab which is one of two craft beer bars in the city. 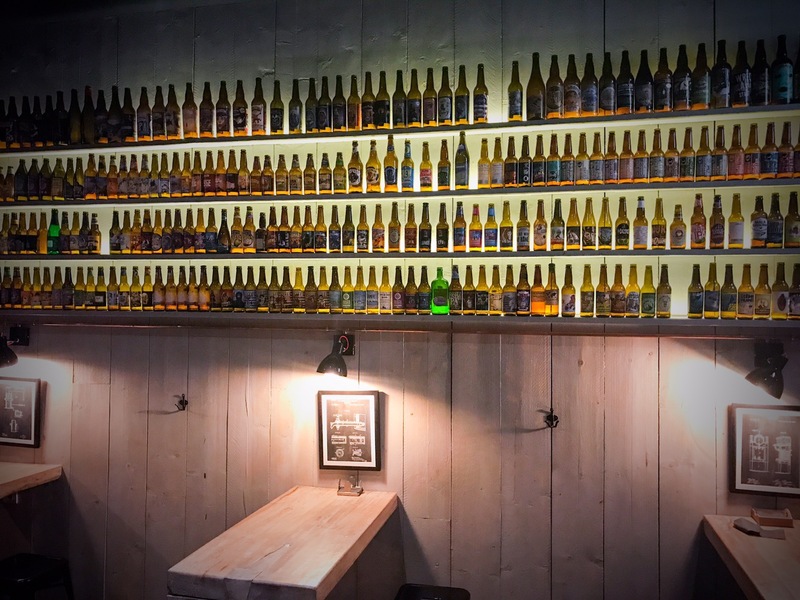 They had 8 taps that were pretty well curated. Not a lot from Santiago, but all were very tasty and the staff really knew their product.